Learn what the ARION dashboard has to offer. With the ARION dashboard you can analyse your data in great detail, compare your running sessions, and track your progress over time. 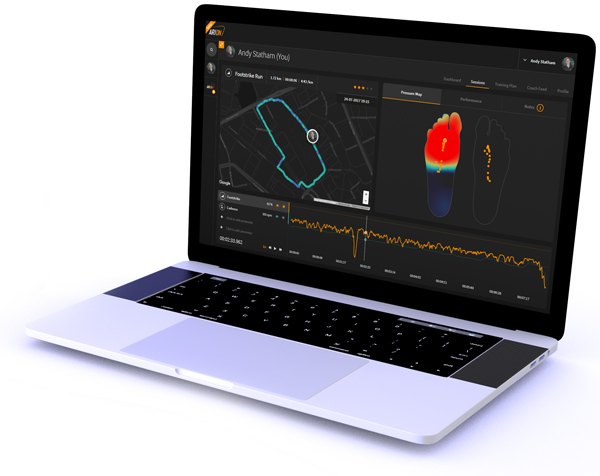 The dashboard, currently in beta, will be expanded extensively in the future with options to connect to coaches and other professionals, create interval sessions and build training programs from scratch, along with many other exciting features. Please use the same login credentials as you use to log in to the app. You will find all of your existing data already there. In this article we'll walk through the existing features to date. With the ARION app, only being available on a smaller screen, it can be less comfortable to sit down and review your running sessions. With the web dashboard you can use the full width and height of your screen to pick up on the smallest details in your technique. With the ARION dashboard you can overlay up to four parameters at the same time. This can give you a lot of insights into how these parameters compare and how they develop over time. In the graph you have control over the way the parameter are displayed (see image below). Use the Eye icon to toggle between hiding/unhiding a certain parameter. You can also use the Star icon to highlight a certain parameter and bring it to the front. This will also display the target zones that you have set for that specific parameter in the graph. Changing the star icon to a different parameter also changes the color in the map (see next paragraph). The dashboard features a multi-colored mapping feature to understand what has happened where. If you like you can toggle to full-screen to get more room to pan and zoom. You can change the parameter of the colors in the map by selecting the Star icon of a different parameter in the graph below. Another neat feature that is only available in the dashboard is the ability to play back your sessions. For this you can use the Play icon underneath the graph. Furthermore you have the option to either slow down the playback (down to 0.5x the actual speed) or speed it up (up to 16x the actual speed). In this graph you have full control over what you see. You can toggle between parameters (and the associated target zones set over time) and the period (most recent, weekly, monthly, or yearly). This way you can quickly see your results compared to your last run, or compared to your results from a longer time ago to see your improvements.